White ink has become a important color on the tattoo artist’s palete. It is used straight from the bottle or mixed with hues to create lighter tints of color. 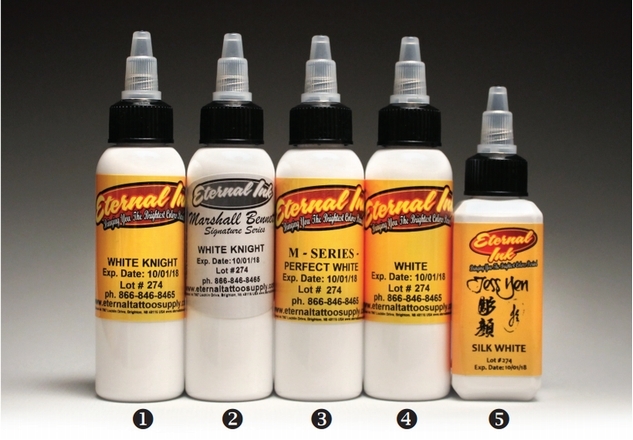 Eternal Ink offers a variety of opaque white tattoo ink. Each white is mixed to high standards, but each has a different consistency. The list below is arranged by ink consistency — from our thinnest to our thickest white ink. White Knight (E61) – This opaque white hue performs as an excellent high-lighting and tinting ink. The consistency is slightly thinner than our M Series Perfect White (MM18). Marshall Bennett White Knight (EMBG) – This white ink is mixed to Marshall Bennett’s exact preference. M Series Perfect White (MM18) – Mike DeVries and Mario Rosenau preferred a white ink mixed to their preferred consistency. The M Series Perfect White is thinner than White (E31). White (E31) – Eternal Ink’s White was the first white in our line-up. It has stood the test of time and remains a top performer. Consistency is smooth with high opacity. Ideal for tinting colors or straight from the bottles for bright white areas or highlights. Jess Yen Silk White (JY05) – A bright white ink mixed to the consistency of Tebori tattoo ink. The Jess Yen ink set has grown quickly in popularity with tattoo artists of all tattoo styles. This ink goes in smooth with excellent color saturation.